The Mitzvah Meals program exists to help congregants of Emanu-El B'ne Jeshurun who are in mourning, ill, or with other special needs. We are looking for people to prepare meals, contribute financially towards the preparation of meals, or deliver the meals. The Mitzvah Meal program has been around for years. This program was designed to assist our congregants who could use a little help at difficult times in their lives. We know that CEEBJ members are willing to help out when needed. We are looking for people to make and deliver a meal to a congregant in need: for a new baby, to someone sick, for someone recovering from surgery, or for any life situation where a meal would be appreciated. You will be asked to make a meal once or twice a year. 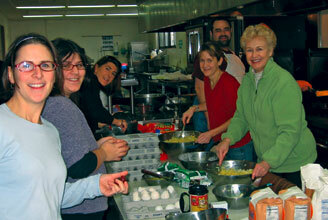 We are looking for cooks to add to our Mitzvah Meals list and those who need a little help with a meal. … then give us a call: Phyllis Dorf at 414-352-3548 or shelandphyl@sbcglobal.net or Florence Fishman at 414-351-0529 or flomar1234@sbcglobal.net. Or, if you yourself are in need of a meal, or know someone who needs a meal, be it a result of illness, death, or a new child, then call Phyllis or Florence, or call Rabbi Berkson at the synagogue 414.228.7545. Contributions can be made directly to the synagogue in care of the Mitzvah Meals Fund. Volunteers from CEEBJ's Ozrim Committee will once again be visiting members of our congregational family, delivering plants and bringing holiday greetings to those members who have physical challenges that may keep them from joining the rest of the congregation for services during the Yamim Nora’im, the High Holy Days. If you would like to join our group of volunteers or if you know of someone in our congregational family who would benefit from a visit, please call the synagogue office at (414) 228-7545.